There are some Moodlemoots coming up in the next two months around the globe. Moodle Moots are always a good place for sharing good practice in teaching, course design, administration and development. 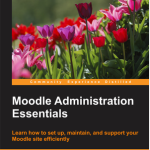 We have just released a new book with Packt Publishing called Moodle Administration Essentials. 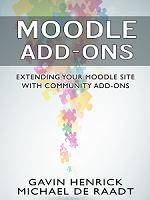 When training new organisations on Moodle administration, our approach has been to focus on just the tasks that they need to get up and running and this book covers those essential areas. There is going to be a Moodle Working Group full day session on the Monday of the Moodlemoot in Dublin on May 11th. Working groups will bring together end-users who are interested in working together to make Moodle better. A working group is not the same as a workshop. Working groups actively involve experienced Moodle users who have an interest in improving Moodle for the community. Working groups should generally have no more than 10 participants to allow each member to contribute. There are likely to be one or two working groups at the Moodlemoot. Earlier I interviewed Michael de Raadt about the Working Groups.. If you want to be involved you can volunteer? Do you have an idea for a working group? Would you like to be a working group leader? Contact Michael at michaeld@moodle.com to suggest a topic.